Localization and Globalization is the process of designing and developing your application in such a way that it adapts to different languages and culture configurations. 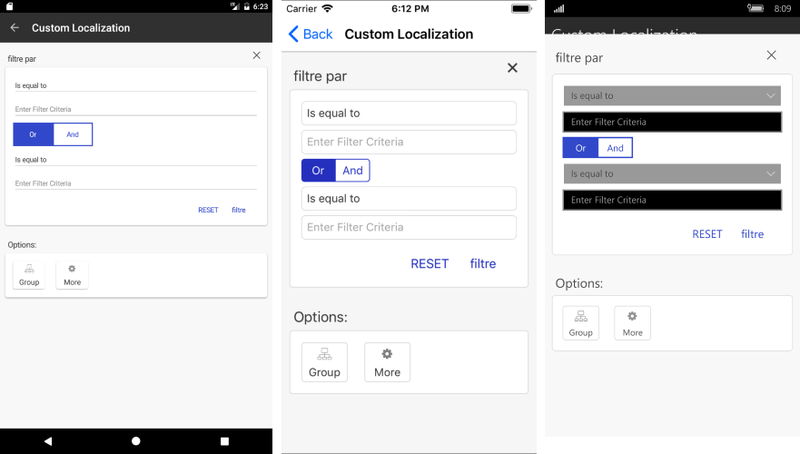 This topic provides an overview on how you could utilize localization and globalization feature of Telerik UI for Xamarin components. In both cases you would need to provide a translation of all the resource keys used inside the supported controls. You can download the complete list with the resource keys used in all the supported components from the SDKBrowser Examples repository on GitHub. To apply localization to your controls just instantiate your custom TelerikLocalizationManager and set it to the static property TelerikLocalizationManager.Manager, before the creation of the UI. Below you could find an example with RadDataGrid control. You should set the custom manager before the InitializeComponent() method is invoked otherwise the default values will be applied to the RadDataGrid. Check below the appearance of the filtering component within the RadDataGrid after the custom localization manager is applied. In the same way as the built-in mechanism for localizing .NET applications uses RESX files and the classes in the System.Resources and System.Globalization namespaces, Telerik Xamarin controls rely on similar setup to achieve the functionality. The resource file ends with "de.resx" and is automatically used when the language of the target device is set to German. You can check a working example in the DataGrid/Localization/CustomResourceManager folder within the SDK Samples Browser.